At the heart of a human being’s circle of love lies the love of Allah. It makes one grow into a mature, dignified, proud and complete being; every kind of beauty stems from it. Next to the love of Allah comes the love of His Messenger. In truth, the path to the love of Allah is bound with the love of His Messenger. The Prophet (pbuh) himself relates in one of his sayings how the love for him is interrelated with faith. "By Him in Whose Hands my life is, none of you will have faith till he loves me more than his father, his mother, his children and all the other people." These blessed words uttered by the one who tells of nothing but the truth signify something very deep. It is usual and natural for human beings to express their love for their loved ones. Especially if this loved one has attributes of grandness and is a uniquely exemplary human being, praising this person with words of admiration and love assumes a value of a different kind. Many poets and orators who were blessed with finest skills of writing and rhetoric wrote poems of praise for the Prophet from which a rich tradition of literature sprang. Examples of this genre including madhiyyah, na’t, qasidah, mawlid, hilyah, mi'râjiyyah, sirah, ghazawat’namah are all precious works of such literature. Some of these works of praise for our Prophet, who is a mercy to the worlds, were recited in his high presence and some were written after he passed away into the world of eternity. We need to emphasize here that the poems composed after the passing away of a person to narrate his/her greatness and fine attributes are in fact called risa (elegy). However, poems of the same kind composed for the Prophet were called madih (poems of praise) rather than elegies. Finding this a much more proper description for their poems, poets of elegy, addressed their beloved Prophet as though he was alive with thoughts of his immortality and his deep, unending connection to this life on Earth. The following people are among those who praised the Prophet to whom we send blessings and prayers each time his beautiful name is mentioned when his blessed body was still in this world. Al Asha’s original name is Maymun b. Mihran. He was among the famous and foremost poets of the Age of Ignorance of Divine Guidance. The oldest poem composed to praise the Prophet (pbuh) is a few couplets from a qasidah by Al Asha. The real intention behind these couplets was not one of praise for the Prophet. After wandering around in a couple of valleys, Al Asha approached the Prophet and recited those couplets with the intention of obtaining something material from him. Therefore, his words contained neither religious excitement nor true love for the Prophet. Mecca was a city of people where everyone from men to women, from the young to the old was preoccupied with poetry. 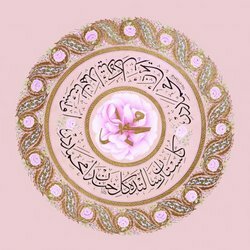 Abu Talib was one of those who composed poems of praise on different occasions for the Prophet (pbuh) whose supreme attributes, exemplary morals, unique virtues and pure ancestry were accepted by everyone from enemies to friends. The uncle and the guardian of the Prophet, Abu Talib, composed a qasidah of ten couplets on the historic cutting off of relations and the blockade by the Meccan idolaters against the Muslims. In this qasidah, he talks about how the people of Quraish turned against him because of his protection of his nephew, then goes on to praise the nobility of Allah’s Apostle and underlines that he will continue to guard him. He was from the Najjar branch of the tribe of Hazrac. Since the Prophet (pbuh)’s grandfather and mother were from the same branch, Hasan b. Thabit had ties of ancestry with Allah’s Apostle. Hassan bin Thabit was born in Medina, which was then called Yathrib, seven or eight years before the birth of the Prophet. He came to be known most famously as the ‘Poet of the Prophet’ after his defense of the Prophet, the companions and the religion of Islam with his poems against the idolaters. You are one of a kind in all creation"
Qa’b b. Zuhair composed poems on certain subjects in the tradition of other Arab poets during the first years of the prophethood. Later on, he satirized the Prophet (pbuh). For this reason, it was decided that he should be killed wherever and whenever he was seen. When the Prophet conquered Mecca, Qa’b and his brother Bujair ran away and came to a place called Ab Rah al-Azzaf. After a while, Bujair said to Qab: ‘You keep an eye on our cattle here. I’ll go and see. I will see this man and listen to what he says. I want to understand what he wants.’ Then he set out for Medina. The letter of Bujair terrified Qa’b. He feared for his life. His enemies from his own tribe frightened him as well by repeating that we would get killed. When he realized that there was no other way out, he composed his qasidah that came to be known as ‘Banat Suad’ (Suad went away, Suad is gone) in which he praised the Prophet. Qa’b stood up; he sat face to face with the Prophet, put his hand on top of the Prophet’s hand. The Prophet however, did not know him in person. Q’ab, who was rejoiced at being granted the forgiveness of Allah’s Apostle, began to recite his qasidah When he finished his recitation of the qasidah with excitement and a shaky voice, the Prophet stood up with a pleased face and he had Q’ab wear the mantle on his back which was called ‘burda’. The first complete example of the literature of ‘madih/na’t’ that survived to this day is this elaborate qasidah of ‘Banat Suad’, composed in the tradition of pre-Islamic Arab poetry. The part that praises the Prophet in this qasidah is rather short and talks mostly about fear, asking for forgiveness and expressing regret, which clarifies the fact that it was not composed out of a genuine religious passion and love for the Prophet, but rather it is along the lines of the traditions of pre-Islamic Arab poetry. For this reason, its language and rhetoric are more strongly emphasized. It received attention and interest mostly in literary circles because of its literary qualities; Sufis on the other hand did not embrace this qasidah unlike many other madihs and na’ts composed later. The truth of the matter is, however, that it would be unfair to expect a poet to put aside a tradition which he followed for years and to compose a truly genuine and novel love poem when he was in fear for his life. He was from the tribe of Hazrac, a native tribe of Medina. He was present at Aqaba Pledges of Allegiance and like Hassan b. Thabit, he composed fine poetry on the occasion of the Prophet’s honoring of Medina with his arrival. Serving the Prophet (pbuh) and the religion of Islam with both his tongue and his sword, Abdullah b. Rawaha participated in all battles of the Prophet. At the Battle of Mutah in the 8th year of Hijrah, he took over the flag and the command of the army after the martyrdom of Zayd b. Kharisah and Jafar b. Abu Talib. He was next to be martyred. With the following remark, it has been narrated that the Prophet appreciated his poems, ‘Your brother would never say a vain or false word.’ and that he complimented Abdullah by telling him that his words had more impact on deniers than that of arrows. When it comes to the poems of praise composed after the passing away of the Prophet, Hasan b. Thabit takes the lead once again. This literature of madih continues onto the era of the Umayyads. It goes through some changes after the beginning of the era of Abbasids and turns into a tradition of composing elegies for Ahl al Bayt and praising the Prophet through the accounts of the lives of the members of Ahl al Bayt. For the entire text, please see Mucteba Ugur, Hz. Peygamber`e Ilk Medhiyeler(First Poems of Praise for Prophet Muhammad), Diyanet Ilmi dergi- Peygamberimiz Hz. Muhammed- Ozel Sayi. Please type '550' into this field. Allahumesole ala muhammed wala ali muhammed!!! i have no word to express my love to you! just my father and my mother be a sacrifice for you, ya Resulellah! Allahumma salli ala Sayyidina Muhammadin Alfatihi Lima Ughlq wal khaatimi limaa sabaq Naasiril-haqqi bil-haqq wal-haadiy ilaa Siraatikal Mustaqeemi wa ala Aalihi Haqqa Qadrihi wa Miqdaarihil 'Azeem.